The incident blocked all lanes of Interstate 5 for nearly an hour, and some lanes remained blocked as crews cleared the scene after the man was arrested Tuesday evening. A man was taken into custody after an hourlong standoff with police on Interstate 5 near Lakewood in Pierce County, according to the Lakewood Police Department. An officer observed the man driving more than 100 mph on I-5 around 4 p.m., police spokesman Lt. Chris Lawler said by phone. He didn’t pull over when pursued by police and drove erratically in the southbound lanes before crashing into a semitruck near Gravelly Lake Drive, Lawler said. The collision sent the semitruck over the freeway barrier into the left northbound lane. Neither driver was injured, according to a tweet from Washington State Patrol Trooper Johnna Batiste. After crashing, the man refused to get out of his car. He held a knife, and it appeared he was going to try to stab himself, Lawler said. Officers fired beanbag rounds, and a negotiator was on the scene, he said. The incident blocked all lanes for nearly an hour. 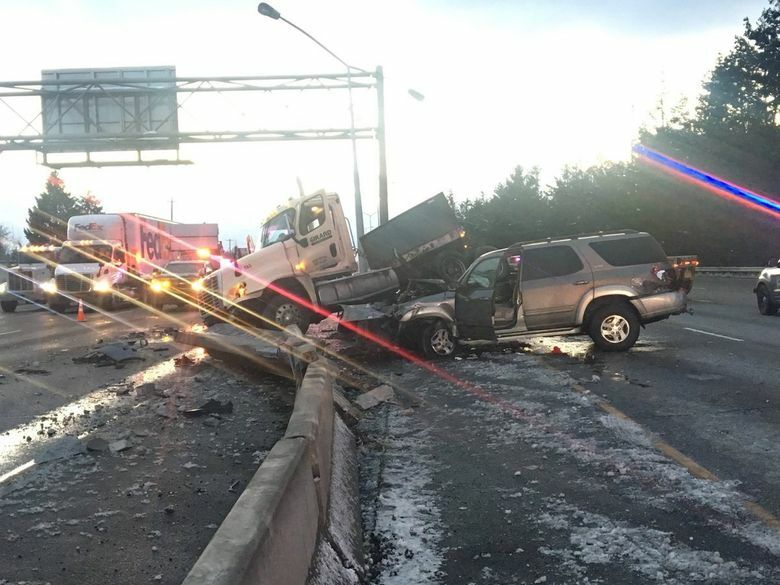 Crews began clearing the scene after the man was arrested around 5:20 p.m., but warned it would take some time before all lanes are reopened, according to a tweet from Washington State Department of Transportation. Two right lanes northbound and one southbound right lane reopened by 6 p.m., according to Washington State Patrol. Northbound traffic was backed up to DuPont, and southbound traffic was heavy to State Route 512 at 8 p.m. Tuesday.